(Philp Corsano) History will tell, but I really cannot see Merkel going down as a leader of the Kohl type. I think you underestimate, at least in my view, the impact of a budgetary squeeze occurring at the same time that there is NO private sector policy to increase productivity, or a public sector policy to increase monetary supply and also the ability to depreciate the Euro for the benefit of the periphery countries like Portugal, Italy, even France. If GDP in Italy shrinks by say 5%, with business going bust, wholesale emigration of talent to places where productivity is rewarded, how is the tax revenue going to keep pace with budget requirements. More cuts will be necessary, more GDP contraction, more businesses going bust, more banks requiring bailouts and even more cuts. This is how you get into a depression. Debt loses value because of a credit event. The other way for debt to lose value is... inflation. This is very, very complicated stuff. It is the very rigidity of the Euro that causes the productivity gap to widen in my view. No country in the EU can come out of the productivity gap with the euro at this level against the US dollar. The periphery needs a weaker currency, but then Germany needs to have appreciation and to invest in productive places in the world. If I have a pile of money in Germany, why would I invest in Greece or Italy if it is still in the euro? No I will invest in China, I will invest in the United States, which is what is happening. How does any of this pyrrhic victory help bridge the productivity gap between Germany and the rest? The productivity gap between parts of the EU will rise not fall if you try to get money out of a stone. Just think, if you are being asked to work say 30% more, but your wages are going down and you truly cannot make ends meet, what will you do. My take is that very few will work harder. If you take away hope, then with nothing to lose, you also push on the pedal of criminality. I have seen this in places like the former Soviet Union. Just so you understand, the economic impact of ECB only focusing on the banks and not monetary policy as a whole, will be disastrous. The economy of Germany will contract. The whole of Europe is an enterprise zone in my view. It needs to attract inward Foreign Direct Investment. Without this, all these budget cuts, which are necessary will lead to bigger failures, greater contagion, more bank failures, and in the end cause massive unemployment, which perhaps only inflation will solve. In my book, this is the one policy that should not have been pursued. 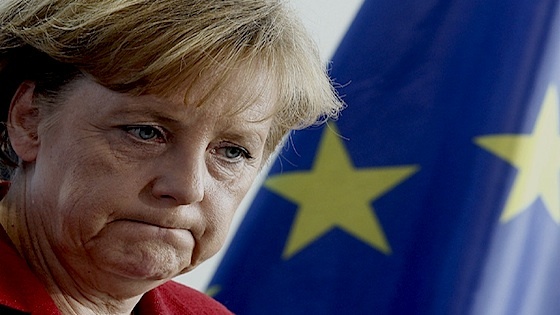 The periphery is weak and has not been able to stand up and say shove it to Merkel. Only Czech Republic had the courage. Hats off to the Czechs.